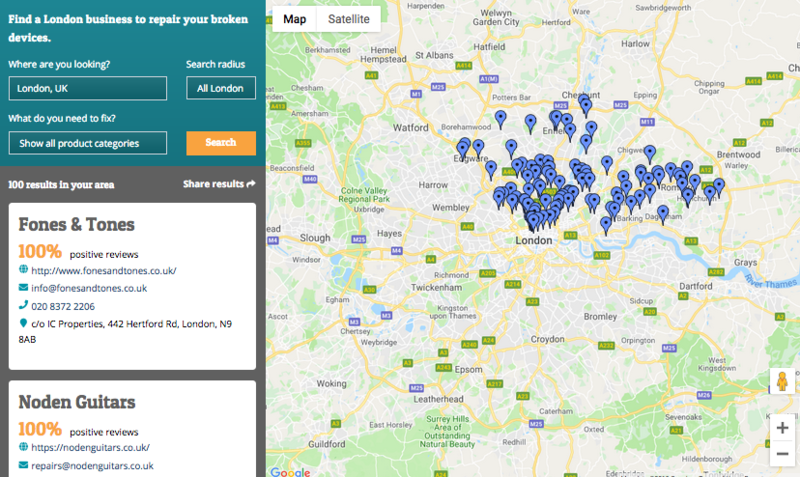 We launched the first version of our Repair Directory over a year ago, listing businesses from seven East and North London boroughs. Thanks to funding from the North London Waste Authority, we now cover all of North London’s boroughs, and we have a total of 100 repair business listed, across 11 boroughs! The directory aims to help people who can’t wait for the next Restart Party or whose device needs professional repair to find reliable local repairers. This project started when we realised from our research with Nottingham Trent University that only 33% of people attending Restart Parties could name a trusted local repairer. For us to list a business on the directory, it needs to meet certain reliability criteria. These include having a trading address, 80% or more positive online reviews (with a minimum of 5 reviews) and providing at least a one-month warranty on repairs. We are looking to gather people’s views on the Repair Directory for the next steps of its development. We would love your help with this – Try it out, then please complete this short survey to give us your feedback. Alongside the expansion of listed business, we now have improved searchability and ways to share results. For example, you can now limit your search to a distance radius, or search for all businesses listed within London. 80% of repairers work mainly on mobile phones, tablets and computers, with only 20% working on home entertainment and home and kitchen appliances. This seems to be a trend as more TV and Hi-Fi repair shops close. Only 1/6 of the businesses meets our criteria for inclusion. Negative reviews: Of the 45% with reviews, very few (only 16%) have at least 80% positive reviews. The main reason for negative comments seems to be the lack of warranty! Unclear origin of spare parts: most businesses are not transparent about the origin of the parts they fit, failing to give consumers a choice of original or replacement parts with prices reflecting this..
Great Matt, we are hoping to offer use of this software to others. Join us on https://restarters.net/about — users will get first crack at using it!